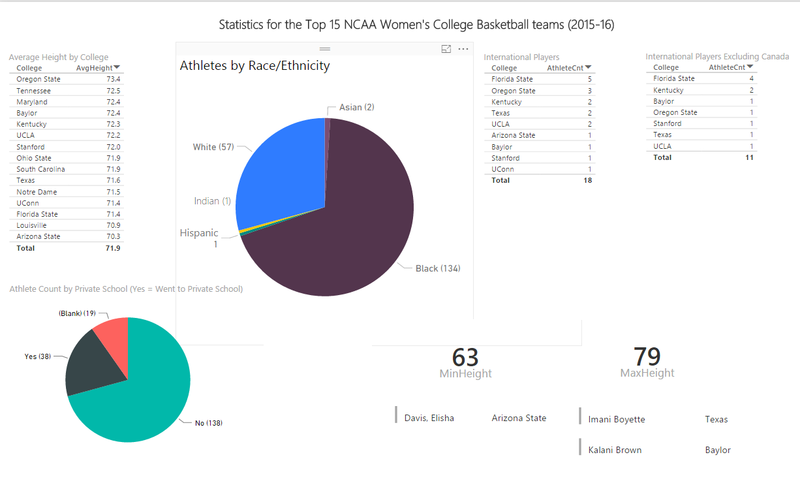 I compiled statistics on the top 15 women’s college basketball teams during March Madness this year using their rosters. I calculated the average height for each team as well as figured out who the shortest and tallest players are. The shortest stands at 5’3″ and the tallest two are 6’7″. While UConn was the number one team, it ranked 12th in height out of the 15 teams I analyzed. I also did some race/ethnicity statistics based on their photos and articles I found, so it is by no means an exact science since it’s not like they list that in people’s bios (also note that if they are half non-Caucasian, they tend to be listed as the non-Caucasian race/ethnicity). All the rosters list the women’s high schools, so I was able to see what percentage go to public versus private school or homeschool. The majority are public schooled (72%). The 19 “Blank” entries represent the 18 international students and 1 homeschooled student- Moriah Jefferson of UConn. In addition to AAU, Moriah played for a homeschool team in Texas during the winter season. Florida State has the most international players of any team. On the next post, I’ll share some other interesting stats and charts, like which states these athletes come from as well as analysis using the schools they came from.